Home » spur » Can a Deviated Septum Cause Facial Pain? Can a Deviated Septum Cause Facial Pain? 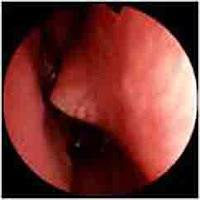 There is a phenomenon caused Sluder's Neuralgia whereby a patient may suffer fairly severe pain over the cheek and around the eye due to a severe deviated septum... not just any deviated septum, but a sub-type called a septal spur. As an introduction, a nasal septum is a wall that divides the nasal cavity down the middle. This nasal wall is much larger than people realize... perhaps a little bigger than a large man's watch. 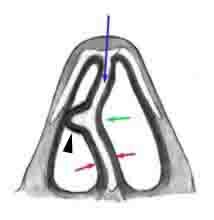 In some individuals, the septum (purple arrow) may be deviated to one side causing narrowing resulting in symptoms of nasal obstruction. In a further subset of individuals, the septum may be even more deviated with a "spur" digging into the side of the nasal cavity as shown by the black arrowhead below. In this scenario, the patient will feel pain in the cheek and eye region on the same side as the septal spur. If nasal swelling occurs, the pain will become more severe. Such swelling may occur from allergies or a viral infection. As such, the pain fluctuates depending on how much mucosal swelling is present. This situation is analogous to a bunion on the foot. Just like the septal spur, if the bunion digs too hard into a shoe, a person may feel foot pain. If the foot swells due to standing or edema, the pain may become more severe. Shown below is a septal spur before and after mucosal lining swelling has occurred. Treatment is a surgical procedure called septoplasty which basically removes the spur and straightens the septum back to the midline. Read more about this type of headache here.